This post comes from the desk of Associate Curator and Curator of the Thomas Bouckley Collection, Sonya Jones. Researching and selecting images for the exhibition Mindful Manipulation was fascinating! Not only did I learn about darkroom manipulation processes but I also discovered some interesting things about early studio practices. For example, hidden mother photography. In the Victorian era, with long exposure times, mothers would often disguise themselves in different ways to hold their children still. Photographers would try to put the focus on the children by camouflaging the mothers as chairs, couches or curtains. There is one example of this in Mindful Manipulation where the mother is draped to look like a chair. The photographer went even further in drawing attention away from the “chair” with a white vignette. This was done by dodging, a process that decreases the exposure for areas of the print that the photographer wished to be light. As a mom, I know firsthand how difficult it is to capture a squirming baby even with today’s technology, and I guess I’m technically hiding too, but behind the lens versus disguised as a couch! 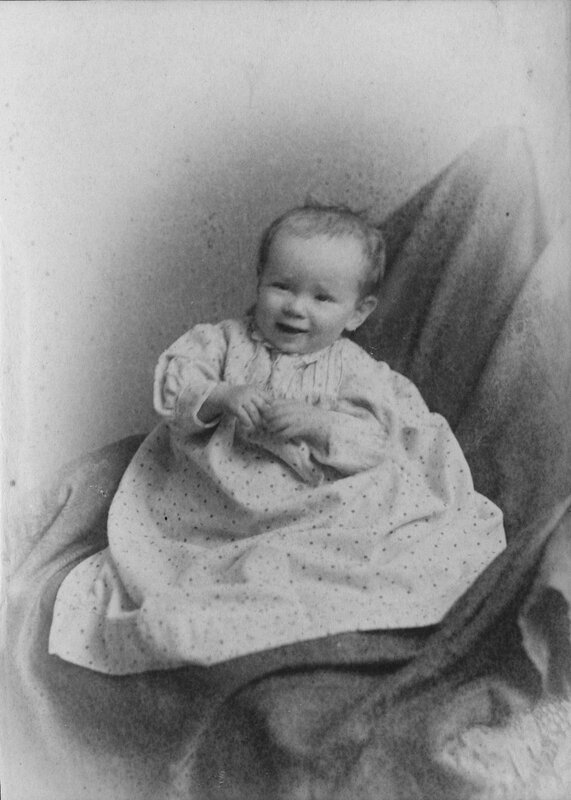 The example of the Morphy baby isn’t as creepy as other examples from this time period. If you Google hidden mother photography the results are hilarious and spooky. The other subject I found interesting in my research was Tall Tale postcards. These postcards began around the turn of the 20th century, and were especially popular in smaller communities where they would exaggerate food sources specific to the region. 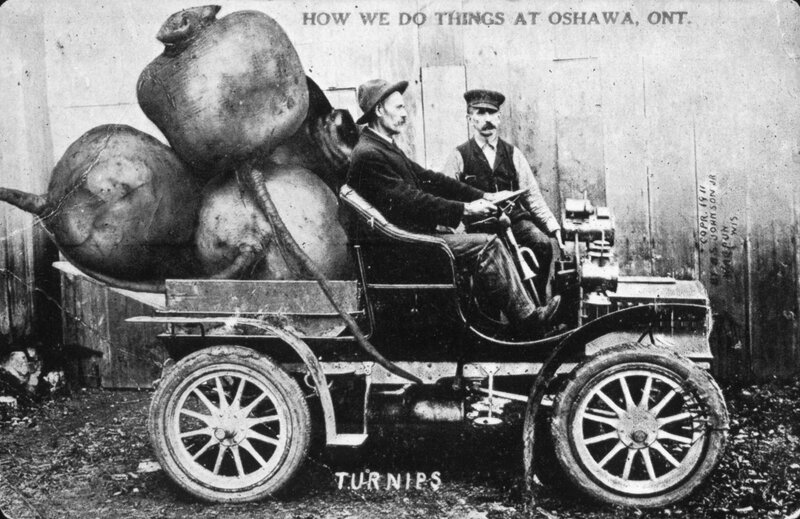 In Oshawa’s case, the tall-tale is that Oshawa’s rich soil produces gigantic turnips, and that fish were an abundant food source. Photographers would take two prints, one a background landscape and another a close-up of an object, carefully cut out the second and superimpose it onto the first, and re-shoot the combination to create a final composition that is often ridiculous but fun. Join me on November 17 for a lecture about the history of manipulated images as well as the emerging field of digital forensics by Deepa Kundur. In this new blog series, our Senior Curator Linda Jansma or Assistant Curator Sonya Jones email artists with questions about their creative experiences. The emails are sent after the opening of the artists’ exhibition, and strive to reveal the experience of showing works at the RMG. 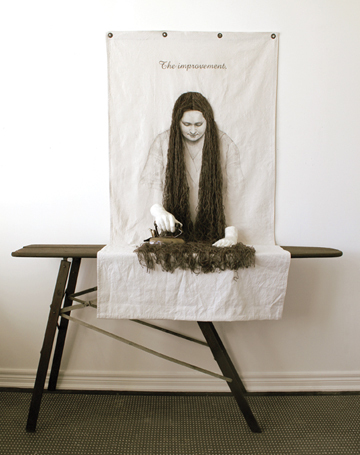 In this edition Sonya Jones emailed Toni Hamel about her exhibition, The lingering, on now until the 24 of November, 2013. SJ: What artists have influenced you and why? SJ: Women often struggle with guilt at feeling discontented with their domestic existence. What would you say to these women? Toni Hamel: It is ultimately a matter of choice. Guilt has many roots. It might stem from religious beliefs, from the social dictum, or from psychological predispositions. It is important to state at this point that this type of guilt is only experienced by women. Since for millennia we have been told to place our value as individuals on our ability to care for our families, it is quite understandable to feel guilty when our aspirations differ from those dictated by our society and/or culture. We are then confronted with an existential dilemma: do we continue living and behaving the way we have always done? Or do we break away from the norm and carve our own path? It is ultimately an issue of self-preservation and survival as guilt, in the long run, may also lead to more serious psychological complications. An easy fix to this dilemma would be to physically remove ourselves from the context in which our guilt finds its fertile ground, to ultimately lead a life that is shaped by ourselves and for ourselves. When this option is not possible, I strongly believe that one way to alleviate one’s own discontent is to express it through a creative process. Such output not only has the power to sooth our soul, albeit momentarily, but it will also allow others to understand how we truly feel. Our creative output, in fact, most times is able to succeed when simple words may otherwise fail. It is a form of communication that bridges the gap amongst us and brings us closer: as couples, as families, as communities, as human beings. SJ: You are refreshingly open about your personal struggles. How has the response from this exhibition been? Toni Hamel: The response has been unimaginably positive, beyond my expectations in fact. A much welcome and collateral benefit of this exhibit has been that it is encouraging other women to come together and share their life stories, to speak about their own personal struggles and collective experiences, and find constructive ways to re-direct their psychological uneasiness. The lingering might be my story, but it is also the story of countless other women, therefore it is very easy for them to recognize their own lives in these works. SJ: What do you hope people will take from the exhibition? Toni Hamel: I hope that The lingering will guide its female viewers through a journey of self-empowerment and self-realization, and direct its male visitors toward a path of understanding, appreciation and admiration for all women. As artists and intellectuals we are called upon to shape the culture of the society in which we live, and I strongly believe that exhibitions like The lingering lead us all in the right direction. Read more about the exhibition on our website. Read an article by Will McGuirk in the Durham College Chronicle. Visit the artist’s tumblr page. Sonya Jones is the RMG’s assistant Curator and Curator of the Thomas Bouckley Collection. In this post she shares a reflection from artist Kate Wilhelm. Revealing Spaces, is a current exhibition featuring three emerging Durham Region artists, Kate Wilhelm, Shaun Downey and Andrea Carvalho. One of the woman depicted in Kate Wilhelm’s photographs of derby girls sadly passed away just this past April. She was in treatment when we first connected by email. We had to keep rescheduling visits because my family was a walking petrie dish all winter and her immune system was in no shape to protect her. If it wasn’t me suffering pinkeye, it was my six-year-old’s scratchy cough and runny nose or my baby’s diarrhea. When I finally managed to squeeze a visit in between illnesses, she told me her lung cancer was incurable. She also said she would skate again. “I just need to get off this damn oxygen, and then I will.” The way she said it, I believed her. I photographed her and Thom just before Christmas. I was about to reschedule because I was still coughing, but she encouraged me to just wear a mask. She couldn’t keep her eyes off my baby, and she wrote me about a month later to tell me how much she enjoyed having him in her home. She had one granddaughter, whom she adored, and she couldn’t wait for more. I did see her once more, before she died, at a party. I hadn’t been expecting her or I’d have brought the copy of Spontaneous Healing I’d been meaning to give her for months. The book sat on the floor by my front door for ages so I wouldn’t forget. Around the end of March, I dreamed about her. I can’t remember now what happened in the dream, but I know I didn’t want to tell her the details. I think I dreamed she died before I gave her the book and I felt awful. I woke up determined to give it to her that week and thinking of another woman’s miraculous recovery from cancer. I tried to make a time to drop the book off, but she never replied. I found the silence ominous, and sure enough, 5 days later she had passed. I only put the book back on my bookshelf a couple of weeks ago. As I type this, the mask I wore when I photographed her hangs on the window right next to me. I don’t know why I’m keeping it. 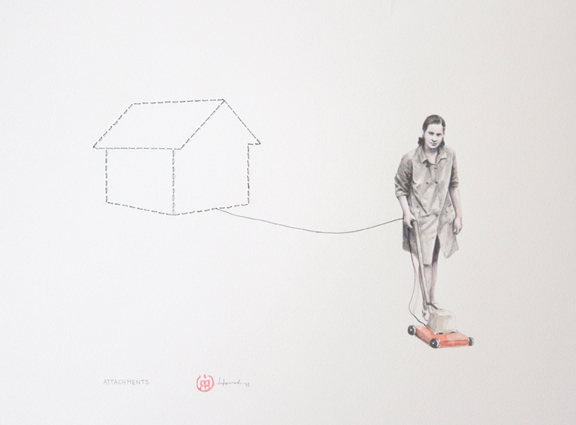 Revealing Spaces is on at the RMG until August 26.